There are so many different formats for dog fencing that we can install for you. Whether you’re looking for a dog fence company to install a basic loop or a double loop pet fence, we can help. 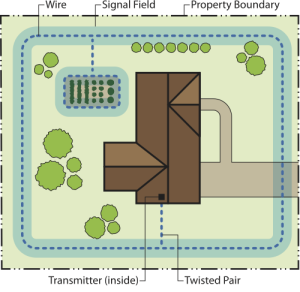 With a garden or pool loop, or you can protect any other area you like. This creates 2 different zones. Allows you to keep your pet in which ever zone you like. 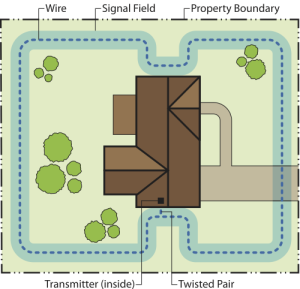 Can cover 1, 2, or 3 sides of your property. Ideal for customers with traditional fencing on part of the property. Also great for Condo’s or Duplexes. 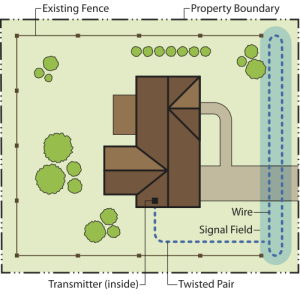 Dog Guard® Out-Of-Sight dog fence is an electric dog fence (or wireless dog fence) specifically designed to keep your pet safe and secure – indoors and out – and is a trademark of Sunward Electronics® and should not be confused with Invisible Fence®. Invisible Fence® is a registered trademark of Invisible Fence Inc. or DogWatch®. DogWatch® is a registered trademark of DogWatch Inc.